Local Afghani subcontractor Aspic Engineering and Construction Company was awarded two subcontracts by ECC Centcom Constructors, the general contractor, on two projects in Afghanistan overseen by the United States Army Corps of Engineers. The first subcontract involved construction of various buildings in the Badghis province of Afghanistan. The second subcontract involved the construction various buildings Sheberghan province of Afghanistan. Both subcontracts included clauses from the Federal Acquisition Regulation (FAR), which were incorporated by reference, and included flow-down provisions obligating Aspic to ECC in the same manner that ECC was obligated to the U.S. government. Aspic Engineering and Construction Company (Aspic), a local Afghan subcontractor, entered into multiple subcontracts with ECC Centcom Constructors and ECC International (ECC), the prime contractor, to construct buildings and facilities in Afghanistan. The subcontracts contained terms and conditions “applicable to all U.S. Government subcontracts,” and mandated that Aspic owed ECC the same obligations that ECC owed to the federal government. 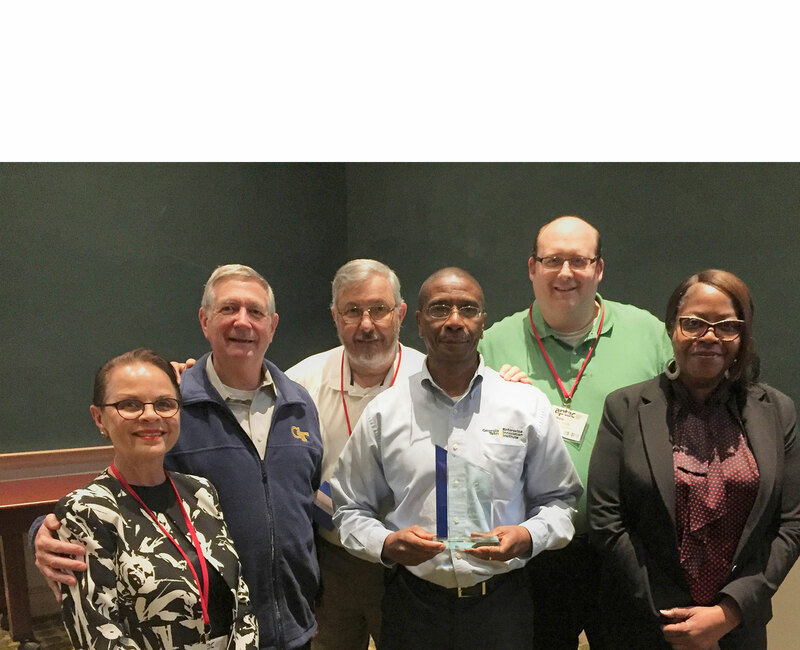 The subcontracts also incorporated multiple Federal Acquisition Regulation (FAR) clauses, including FAR 49.2 through 49.6, which govern the recovery of expenses in the event a contractor is terminated for convenience, i.e., required documentation and procedures. In 2014, ECC was terminated for convenience, so ECC notified Aspic that it also intended to terminate Aspic’s subcontracts for convenience. Aspic, in turn, submitted multiple settlement proposals to get paid for its work under the subcontracts. When ECC denied most of Aspic’s proposals, Aspic filed for arbitration, seeking payment for its costs of partially performing under the subcontracts. Despite Aspic’s failure to comply with the FAR requirements governing payment for partial work in the event of a termination for convenience, the arbitrator awarded Aspic over $1 million. 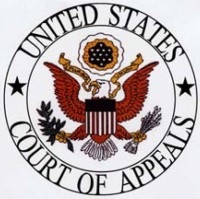 The arbitrator concluded that Aspic was not required to strictly comply with the FAR requirements based on several factors, including: (i) the subcontracts were drafted to give every advantage to ECC; (ii) it was not reasonable to expect that Afghan subcontractors would be able to conform to the strict and detailed requirements of general contractors on U.S. Federal projects; (iii) it was not reasonable that the parties had the same expectations; and (iv) there was not a true meeting of the minds. To view the full text of the court’s decision, courtesy of Bloomberg, click here. If an agreement qualifies as a “subcontract” under a government contract, then it may be subject to certain flow-down, compliance, and reporting requirements. These requirements are intended to protect the government’s interests, and have significant ramifications for contractors, e.g., increasing transaction costs, expanding potential areas of exposure. These compliance obligations and risks can even deter some companies from performing under government contracts, especially those companies offering commercial items. 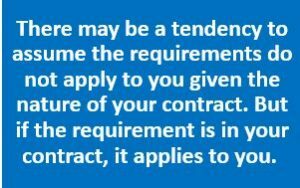 Currently, there is no uniform definition of “subcontract” in the applicable procurement regulations or in the procurement chapters under Titles 10 and 41 of the U.S. Code. 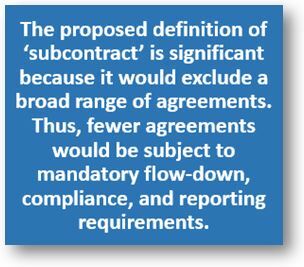 Indeed, there are more than twenty varying definitions of “subcontract” in the FAR and DFARS, with many clauses failing to specify which definition applies. Now Congress is looking to address this lack of uniformity through the FY 2019 National Defense Authorization Act (NDAA). Government contractors are subject to cybersecurity requirements, found in the Federal Acquisition Regulation (FAR) and each agency’s supplement to the FAR, and some important deadlines are fast approaching. Set forth below is a high-level overview of cybersecurity requirements found in the FAR and the Department of Defense (DoD) FAR Supplement (DFARS). 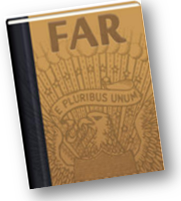 The FAR requires government contractors that handle “federal contract information” to comply with 15 requirements for safeguarding that information. These requirements are similar to certain requirements found in NIST SP 800-171.
information, not intended for public release, that is provided by or generated for the Government under a contract to develop or deliver a product or service to the Government, but not including information provided by the Government to the public (such as on public Web sites) or simple transactional information, such as necessary to process payments. This is a broad category of information, and some commentators have suggested that it would apply to “virtually all” federal contracts. What’s that cybersecurity FAR clause doing in my contract? Many contractors we talk to believe that cybersecurity requirements are exclusively a concern of contractors working with DoD or with highly-classified, top secret projects. While perhaps true to some degree in the past, that belief is now outdated. In recent years, the federal government has steadily expanded the reach of cybersecurity requirements imposed on contractors and contracts of all shapes and sizes, and that trend is expected to continue. As an example, one year ago this month the government implemented a new FAR clause, FAR 52.204-21, entitled “Basic Safeguarding of Covered Contractor Information Systems.” This clause, which went into effect on May 16, 2016, brings basic cybersecurity requirements to many federal contracts. The clause is supposed to be inserted in every solicitation and contract where a contractor or subcontractor at any tier may have federal contract information (FCI) residing in or transitioning through its information system. Prime contractors are also expected to flow down the clause to subcontracts at all tiers that may have FCI in their systems, including subcontracts for commercial items (but not subcontracts for commercial off-the-shelf items).